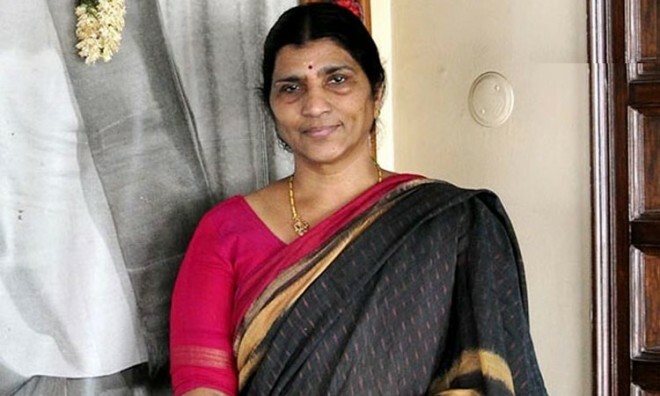 Amaravati, Apr 05: Nandamuri Lakshmi Parvathi, widow of legendary actor, former chief minister of combined Andhra Pradesh and Telugu Desam Party founder NTR, joined YSR Congress party before 2014 assembly elections, to remain in political limelight as there were no takers for her during the bifurcation period. But, she had never been considered an important leader in the YSRCP. She was not given any prominent post for a long time and she never used to come to Lotus Pond or other party offices to address press conferences. Even when she attended a few rallies of party president Y S Jaganmohan Reddy, she was hardly given any time to speak to the people. Nonetheless, Lakshmi Parvathi's importance suddenly started growing. She was made party's general secretary and was given the opportunity to speak to the media at the YSRCP office. She has become a regular visitor to the party headquarters. And, Lakshmi Parvathi has now started addressing election rallies as well for YSRC. She addressed a big election rally at Mangalagiri in support of YSRC candidate Alla Ramakrishna Reddy. As expected, she primarily targeted Telugu Desam Party president and chief minister Nara Chandrababu Naidu and his son Lokesh. She explained how Naidu had back-stabbed his own father-in-law and snatched TDP from NTR's hands but was all praise for Jagan for setting up his own party for the sake of people. Describing Lokesh as her grandson, Lakshmi Parvathi ridiculed that he still had not learnt how to pronounce Mangalagiri properly. "I don't think he will do any good for the constituency as well," she said. Apparently, Jagan thought Lakshmi Parvathi was the best person to target Naidu and Lokesh, as she was the victim of Naidu’s conspiratorial politics. Especially after the release of recent film "Lakshmi's NTR" made by Ram Gopal Varma, Lakshmi Parvathi is back into limelight and has become a known name in the new generation voters. Because of the film, people are able understand what exactly had happened in 1995 and what led to NTR’s defeat. Naturally, people would be curious to know about Lakshmi Parvathi and see her personally as the widow of NTR. And that would definitely make some impact on the wining prospects of YSRC! AP.